Green tea versus oolong tea - understand the difference to help you decide which tea to drink next! If you want scientific credibility, go for green tea. It is more “proven” and has been shown to burn more fat. However, you can't drink green tea with your meal as it can upset your stomach. On the other hand, oolong tea is a good accompaniment to greasy food. It is better for blocking dietary fat absorption. Overall, it is too early to say which is better for losing weight. They just work through different pathways. Reason: Green tea has a slight edge, but overall hard to tell. This is an area where green tea wins hands over feet over all other teas. The scientific evidence of green tea benefits is overwhelming, both in term of quantity and quality. At the end of 2006, the Pubmed database contains 2,500 green tea studies, with about 350 published in just 2006 year alone. It is still too early to conclude that green tea antioxidants are more powerful than oolong or black tea, but that seems to be the way we are heading. All tea beverages have some side effects. There is little difference between different types of tea if you drink only quality tea. Tea plants accumulate minerals from soil and water. This can be a problem if you are drinking from a low quality tea garden suffering from environmental pollution. Green tea has one advantage. It is made from younger leaves, which accumulate much less contaminants than the more mature leaves. I highly recommend that you drink high grade green tea or white tea that are made from young tea buds that are harvested early spring, when the cold weather means pesticides are not used. Also they should be cultivated in high altitude, where there is little road traffic pollution. When buying an oolong tea, I highly recommend you get a quality tea that can be infused 3 to 5 times. You can greatly reduce the risk of pesticides by rinsing the tea in hot water first. We call it "tea washing". Reason: High grade green tea made of young tea buds will protect you against contaminants. Many people complain that green tea tastes bitter or grassy. That is because they are drinking a low grade. Quality green tea tastes exquisitely sweet, without the need to add sugar. It needs to be stored with great care to keep fresh. 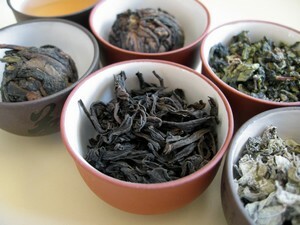 Oolong tea has a large spectrum of tastes and flavors. It makes a stronger brew and may be easier to appreciate for ex-coffee drinkers. The darker oolong tea does not expire easily and can be stored for a few years. The price of a highly-sought-after oolong tea can match those of green tea, but there are many more expensive green teas than oolong teas. Why? Because the best green tea gardens in China only harvest once a year in spring, for not more than 6 weeks each season. These young tea shoots are tiny and available only in small quantities. Most oolong tea gardens harvest at least 3 times a year - in spring, summer and autumn. The leaves are larger and available in greater quantities. Reason: A high grade green is a rare find. Result? 3 to green tea, 1 to oolong tea, 1 draws. Does it mean green tea is better? Not really. Different people like different teas. It really is a matter of personal taste. Why don't you try both and see which one you like? According to Traditional Chinese Medicine, it is good to drink more green tea during summer and oolong tea during winter. There is a place for both in a balanced tea diet. What are the advantages of drinking green tea? What are the disadvantages? Does white tea weight loss work? What are the advantages and disadvantages?